Popular media has taught us that anyone can be an archaeologist. It’s easy, right? All you need is a shovel, a couple buckets, and maybe a cool whip to fight off some Nazis, and you’re all set to discover some nifty caves and make a ton of money off golden idols! Right? Time for an archaeological dig! Well, not so fast. What Indiana Jones doesn’t show us are the years of study, fieldwork, and tedious lab work that go into archaeological study. And it definitely doesn’t show that if you want to be a respected archaeologist, you need to join a professional archaeological society and agree to abide by its standards of ethics. That’s ridiculous, you say; the archaeological record is available to everyone and shouldn’t be restricted to a bunch of snooty professionals. I should be able to dig up whatever I please, you say, because history belongs to everyone! Thing is, that’s not really true. There are a number of groups with specific cultural ownership of archaeological remains, and archaeologists have to respect that ownership and act accordingly. First and foremost, the descendants of the group or culture being studied have a right to their history. This means a number of things for archaeologists. Firstly, graves should not be excavated without the permission of the descendant community, no matter how much information could be gained from the excavation. The pillaging of sacred Native American graves by white North American archaeologists in the past caused a great deal of backlash, resulting in legislation like the Native American Graves Protection and Repatriation Act (NAGPRA) of 1990. This also means that archaeologists need to maintain open and respectful communication with the descendant communities that they are working with, when both planning an archaeological project and interpreting its results. Don’t be this guy. Bald eagles will get really mad at you. Apart from descendant communities, the public has a right to the archaeological record. You can’t just dig stuff up, put it on a shelf, and not tell anyone about it; you could be hiding away new information that might change the way history is taught or help us think about some of the challenges facing the modern world. In its Principles of Archaeological Ethics, the Society for American Archaeology lists just a few of the possible audiences for archaeology, which include students, politicians, journalists, and many more. Archaeology should be a tool to promote learning and come to new understandings about the past and the present, not just to add to your collection. Whoever put together this arrowhead collection was not complying with archaeological standards of ethics. These are artifacts, not wall décor! Finally, future archaeologists have a right to the archaeological record, too. That’s why stewardship is the first principle in the SAA’s list; archaeologists are obligated to preserve sites so that future archaeologists with better technology and different perspectives can also learn from them. So the next time you’re tempted to start digging for treasure, remember that the archaeological record doesn’t just belong to you, and put that shovel away. National NAGPRA. National Park Service, n.d. Web. 14 Nov. 2013. <http://www.nps.gov/nagpra/>. “Principles of Archaeological Ethics.” Society for American Archaeology. SAA, n.d. Web. 14 Nov. 2013. <http://www.saa.org/Default.aspx?TabId=203>. Sabloff, Jeremy A. Archaeology Matters: Action Archaeology in the Modern World. Walnut Creek, CA: Left Coast Press, Inc. 2008. Print. 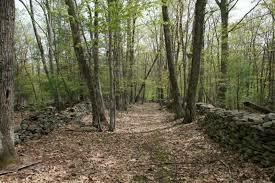 Who would have thought that walking around aimlessly for hours in the woods is the easy and quick part of archaeology? All in all, the stereotype that archaeologists spend most of their time in the field excavating and collecting artifacts is completely untrue. Previously I had just accepted this to be fact from readings and lecture concerning the intricacies of archaeological research. However, recently I’ve been able to experience the full brunt of the life of an archaeologist through lab, and it is not an easy one. 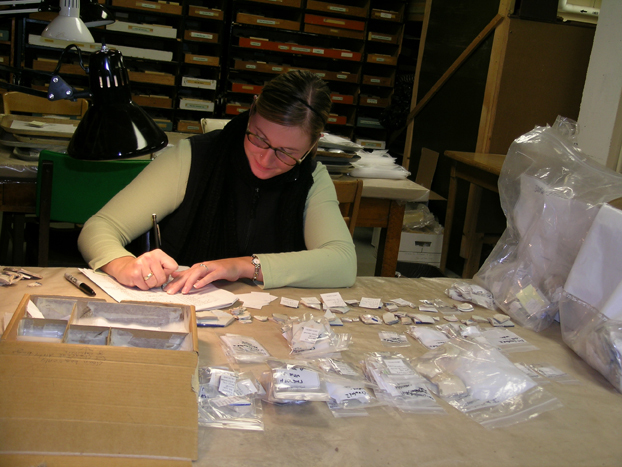 Lab work is an imperative part of archaeology, providing for much of the actual results and findings that occur. 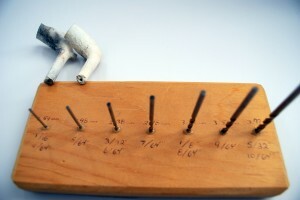 Rarely is a piece ever just picked up in the field, examined right then and there, then accepted as fact and put away. 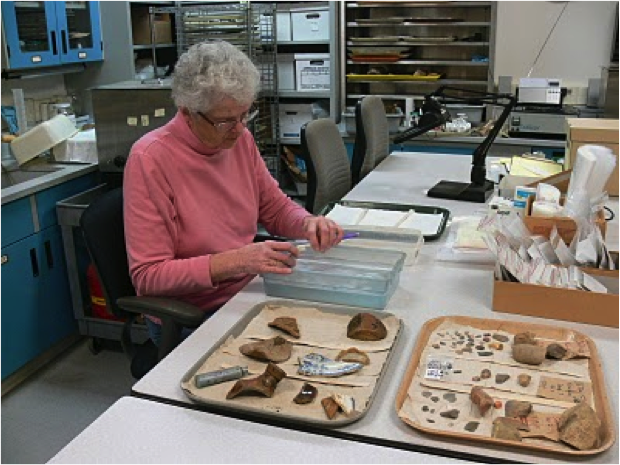 In lab the artifacts are observed, recorded, sorted, and in some cases put together again from tiny fragments. So, lab work comes with many more subtle complications than field work. In the field the general dangers of spending so much time performing strenuous work in the outdoors are present, and can take an exhausting toll on the body. Similarly, lab work can take a toll on the mind, as classification systems and identification becomes increasingly difficult to do once the artifact has been through a dozen hands, some of which might be mislabeled or broken. The images that come to mind in thinking of archaeology are mostly that of field work but the meat of the field of anthropology is lab work. The lab work I performed was more than anything rebagging and assorting hastily labeled and disorganized artifacts with a colourful history of tug and pull. They had belonged to private hands, and was to be possibly donated to a museum, but as the bill ranked up for the archaeological work to be done on the artifacts(evidently archaeology is not for the frugal of heart) ownership became complicated up until the point where they are just being borrowed indefinitely for the time being. This contributed to the clutter of the artifacts worked on. Thusly, my initial sentiments toward lab work was that it seemed like some cruel joke, bagging and rebagging bags upon bags of stuff that was sometimes more dirt than artifact, and squinting at a tiny bone for ten minutes to figure out whether it belonged to a bird or an annoyingly small rabbit. Once you get into though, the work itself is incredibly simple. Half the time spent in lab was sifting through a pile of similar centuries old objects and playing One of These Things is Not Like the Other. This becomes the essential component of lab, recognizing when an artifact needs to be classified separately than the material it was grouped with before, and vice versa merging groups of items together for the sake of coherence in sorting. 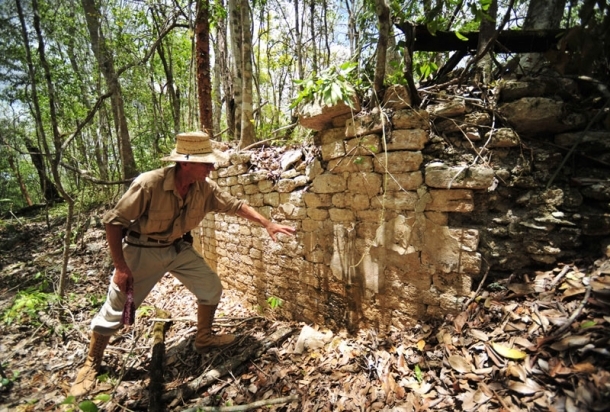 Although archaeology is thought of many times as the dangerous and exciting field work of the likes of Indiana Jones, the work that goes into labeling it all is the vital step that gives an artifact meaning, putting it into context of where it was before and how it played into the lives of the people there years ago. Context is very important. Context is especially important to archaeology and the study of artifacts. Without context, the artifacts have no meaning, a piece of glass is just a piece of glass, and a plate is a plate. If we don’t know where an item was found and what it is in relationship to the site and the site’s past then it means nothing. 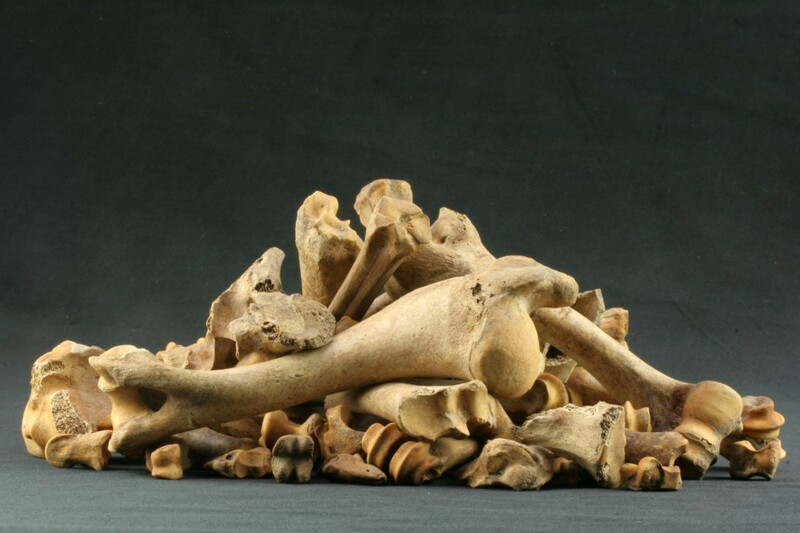 Is this just a pile of bones? or with context could this mean much more? For instance, a bunch of cow bones is just a pile of animal bones, until we factor in that it was found in the dump site of an 17th century pub and inn, and the cut marks on the bone shows that it was hand sawn and the cut of meat that it was shows the socioeconomic class that the people who ate the cow were in, and therefore reveals the people whom the pub catered to. Any other bones can do the same thing. Different fish are found in different areas, and different people and social classes eat certain kinds of fish. By finding a particular fishes bones in the inn we know that they fed and whom they traded with, as well as at that time, and what was available to them. 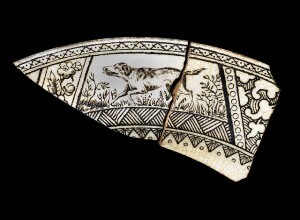 Bones, as well as many other artifacts, such as plates and ceramic bowls, can be very useful in finding this type of information out, but only if there is context and background. The different patterns on plates can tell us if they were decorative or used in every day life. The type of style and skill that went into the plates can also tell us how they were used, when they were used, and who used them. 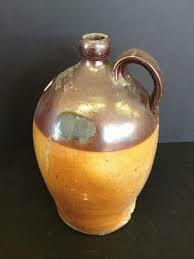 The same goes for ceramic bowls, for if only the outside was decorated, that means that it was a larger bowl or vase, with a smaller opening on the top, or that it was meant for other people to look at, while decorations on the inside means that it was small or meant for more personal use. Still, context is very important. 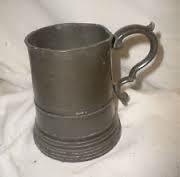 If this was found in the inn, then we know what it was used for, and if they were nice plates and bowls, what types of people they housed. This idea of context can also be applied to where in the site it was found. Many hours are spent labeling the bags where the artifacts have been placed, with detailed locations of where the artifacts were found, at what test pit, with a unit number and other specific location identifiers. Location is very important to context and the meaning of an artifact, for if bones were found in the dumping site of a house, then they would mean a totally different thing then if they were associated with a barn or pub. In general, artifacts aren’t just pieces of pottery, or a pile of bones, they are items and objects that, because of context, lend themselves to a bigger picture and a better understanding of our world. Lazy Friday Afternoon, Let’s do….Lab Work? I’m just going to come straight out with the most exciting, best learned lesson from lab work. 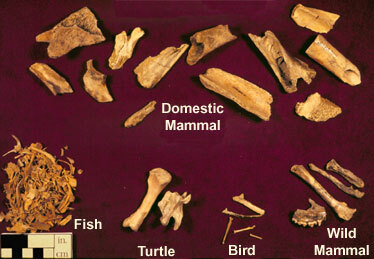 I’m a bone expert and can tell the difference between mammal, bird and fish bone to a T. Impressive I know. Besides this mind blowing fact that has changed my view of myself, I was pleasantly surprised to find out two things. First, that archaeology has a lot of work (aka lab work) to do once done with the grueling excavation process most people think to be the only part of archaeology, second that it can actually be quite entertaining and fun. One could almost deduce that excavation is the easy part. After that, one has to take everything found, and separate it into bags according to what it is. If thats not a lot of work, you have to label everything exactly where it came from. And although we did not need to do this during our two hour lab experience, one also has to clean the artifacts and perve them. 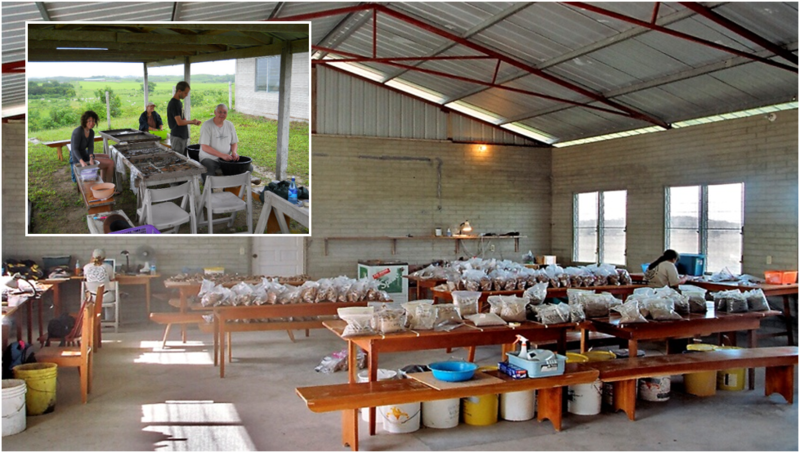 A challenging aspect of our lab work, specifically, was having to relabel and separate bags already labeled, we had to fix inconsistencies for artifacts, and didn’t always have the information right or in some cases at all. Therefore, having to label them as surface finds, in a case of a medicine bottle that came with no information. This emphasized the large importance of small details not being overlooked and following protocol to clearly and correctly label everything that needs labeling. I think its pretty clear that there are many stereotypes about archeology, how it is basically Indiana Jones, right? Even if someone has overcome that stereotype, many people still don’t picture archeologist in a lab, sitting on turning chairs, in nice work clothes, listening to music, with bright pink painted nails, sorting through everything found at a site. 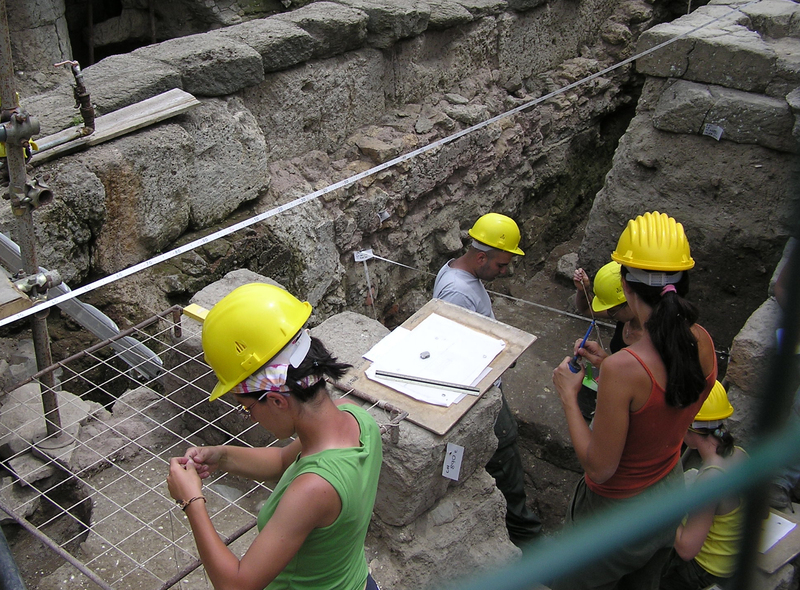 But it is a large part of archaeology, and this lab experience showed exactly this. That without this last step in the lab, excavation would be worthless. My statement earlier might be misguided though. Sitting in air conditioning singing along, or I was singing my heart out, while my classmates gave me a quizzical glances, to songs I love, learning about history and sorting through artifacts that were actually really cool and intriguing was something I enjoyed on a Friday afternoon. More importantly though, something very necessary and important to the process of performing an archaeological excavation on a site. People tend to not look past whats put in front of their eyes. In this case, seeing artifacts go straight from digging to a museum. They miss one of the most important steps, and without this step, archaeology would not let us look back in the past, to help the better the future. 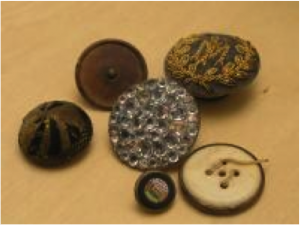 Archaeological Lab Work: Buttons, Marbles, and Glass, OH MY! Have you ever wondered what the job of an archaeologist entails? Is archaeology as action filled as it is depicted in the Indiana Jones movies? This past Friday, I was lucky enough to put some of my own lingering questions about archaeology to rest. Through laboratory work with my archaeology class, I got a glimpse into the life of an archaeologist. Unfortunately, I did not take down any bad guys or run through any deserts, but needless to say, the experience proved to be quite interesting. My hopes were not especially high for the lab work section of my archaeology course. Frankly, I was under the false impression that it would consist of manual labor in an eerie basement (plus, who really wants to do any sort of work on a Friday afternoon). However, I quickly realized just how terribly I had misjudged archaeological lab work. 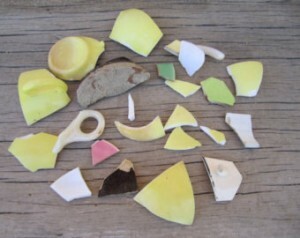 After recovering an artifact from a site, an archaeologist must create some order in what otherwise may appear to be a random set of objects. Thus, they work to classify the artifacts according to certain criteria. 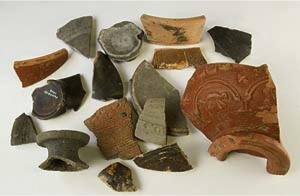 First, artifacts are generally classified according to material: glass, metal, ceramic, or stone. Within these groupings, archaeologists may sort them further. For example, glass may be sorted into two divisions: window glass and vessel glass. Once categorized, artifacts can be stored and then labeled based upon their respective trench unit and stratigraphic layer in which they were found. While many people believe that an archaeologist’s main focus is to find an artifact, in reality, all of this work is completed with the main goal of finding out the effect that an artifact had on a culture–to determine that the button belonged to a rich man and the marble was, indeed, used by a boy in a schoolyard. 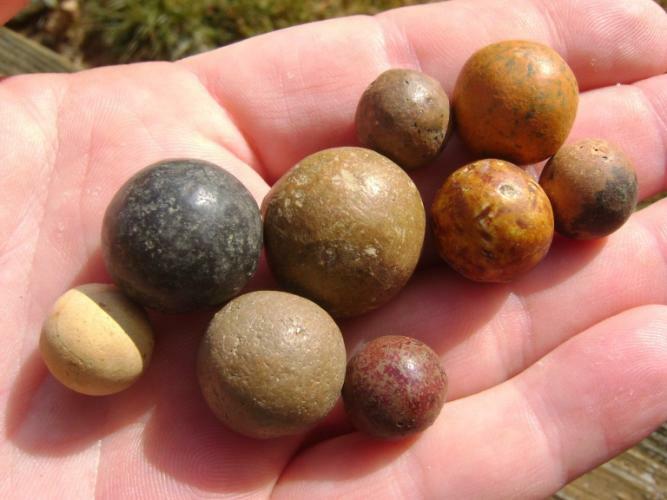 In the end, the tiniest of artifacts can reveal the most about a past culture. Through a hole in the fence we entered the wilderness. With countless fallen tree branches and slippery mossy stones jutting out the ground, we needed to be as swift as a deer to jump over the obstacles. It is a paradox that we could not really act like a deer, because the nearby hunters thinking we were deers might mistakenly shoot us. This trek fitted perfectly with a stereotype regarding to archaeology–archaeologists are always accompanied by mysterious forests, poisonous bugs, and hands full of dirt. We were in a forest, we had dirty hands, but no bugs, if frogs did not count, probably because we all had sprayed ourselves before. However, the excitement of going on my very first real field trip dissipated all the concerns and made me enjoy it. In the woods of Acorn Hill. Askohan Reservoir in the Catskills Mountains, lying ninety-three miles north of New York City, was completed in 1915 to provide clean water for the city. While water was transporting through ninety-two miles long aquaducts to slake the thirst of New York City, eleven towns and thousands of arces of farmlands were vanished underwater. Hoping to know how the construction of Askohan Reservoir affected local people’s lives and reshaped rural landscapes, we were here. 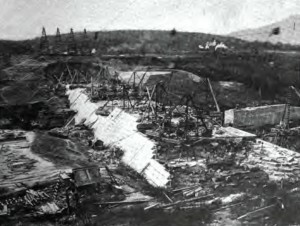 Olivebridge Dam under construction to build the Ashokan Reservoir circa 1910. 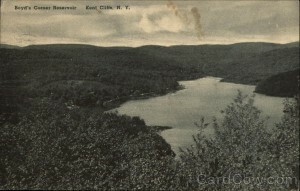 The Ashoken Reservoir seen from Monument Road in Ulster County, New York, USA. Finally, we reached the site marked by a washing machine in 1940s, and spilt into three groups to start working. Two groups were dealing with a sampling unit, with each of the three members in a group responsible for different jobs, describing the artifacts, writing down the descriptions, and drawing pictures in the notebook. Instead of staying motionless beside the unit, my group with Dr. Beisaw walked around to gain a better understanding of the adjacent area. There were several piles of stones not far away, on which scattered all kinds of glass, ceramics, metal cans and even shoes. According to Dr. Beisaw, these piles of stones were remains of houses of domestic people, while the bigger piles of soil to the right were industrial records of the exploitation of bluestone in quarry for the construction of the dam over the reservoir. Moving on, we were amazed by a huge man-made platform of stone about six feet high, because there used to be a entire mountain of stone over fifty feet, which completely disappeared after being quarried. At last, we drew a simple map of the area near the sampling unit and highlighted the piles of stone and soil, road and quarry. When Charlie Brown said that on Halloween, he was less than excited. But that’s because he wasn’t doing archaeology, where finding rocks, especially those that are part of foundations or walls, is awesome! Getting a rock for trick or treating is less fun but I digress. When you think of archaeology, you probably imagine giant excavations, where people are uncovering dinosaur bones or ancient cities. When I went out to do fieldwork for the first time, that wasn’t exactly what we did nor what we were looking for. Surveying is a technique to find archaeological data, which doesn’t include any digging but thoroughly scanning an area (on foot, in our case) looking for evidence on the surface. It often comes before excavation (well, you have to find sites before you can dig, right?). So basically, we went exploring in the middle of the woods. No trails and lots of tree roots hidden under leaves waiting to trip you up (living dangerously). As we navigated the hilly terrain (a great work-out, by the way) we were keeping our eyes out for evidence of a town that used to exist in Richardsville, near Kent, New York. 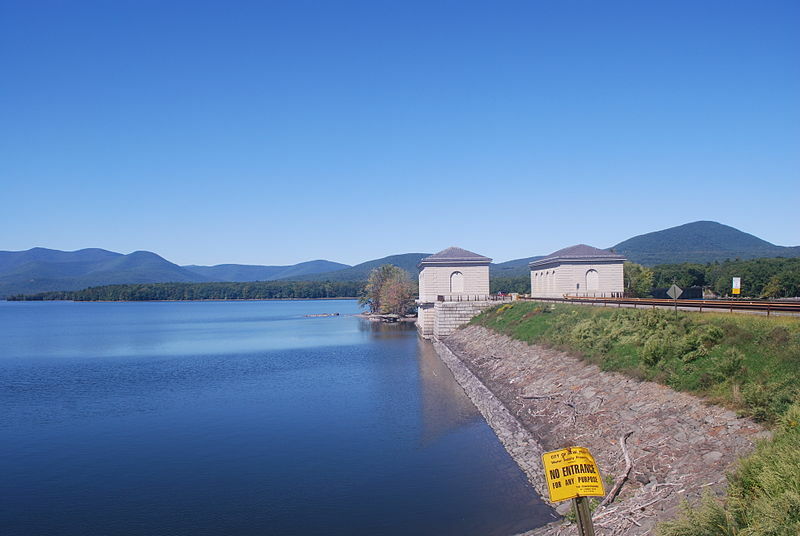 New York City took over the area to make and preserve reservoirs for the city in the late 19th – early 20th century, so the town was abandoned. Dr. Beisaw wants to examine how the uprooting affected the local people and culture. Conclusions drawn from the past can help determine how regulating people for environmental reasons will have an impact today and how to lessen said impact. That’s the point of archaeology, to use the past to help improve the present and future! For anyone interested in learning about the watershed conservation controversy, here is an interesting segment about it from WNYC radio. The reality is that if you haven’t already explored the area you’re researching, there is no way of knowing if anything is there. My group’s trails didn’t seem to be yielding many results. However, when we reached the end of our assigned area, we did end up finding something! We came across a large, curved stonewall and a metal sheet (part of a roof, perhaps?) propped up on rocks on the inside of the curve. We speculated that there might have been construction in the area, especially given the concentration of large boulders and other rocks that most likely were not deposited by nature. 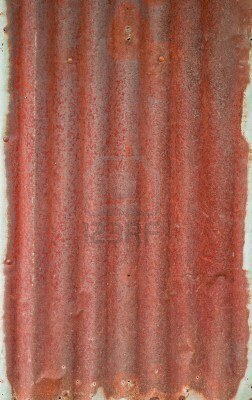 This is similar to the metal sheet we found. It doesn’t look like much, right? Well, when you come across this in the middle of the woods, after hours of looking for evidence of human habitation, this is one of the coolest things ever. Overall, fieldwork has to be approached with an open-mind, open eyes, and the energy to hike! And we didn’t just end up with a rock, we got a whole wall of rocks!